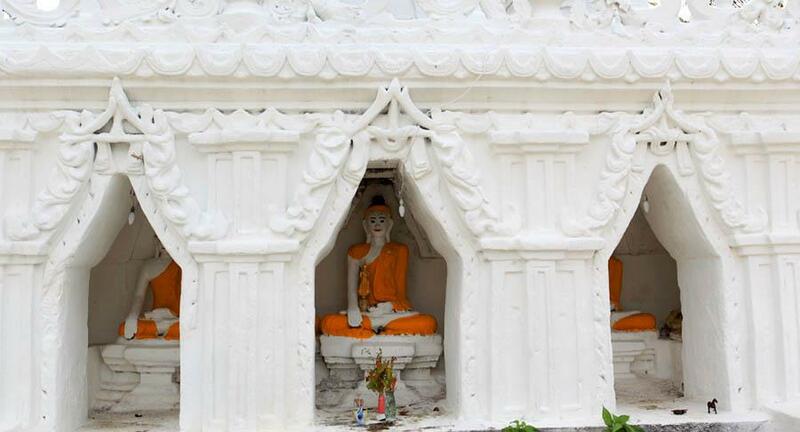 Photo Gallery of a temple Wat Phra That Doi Kong Mu located at the 424-meter summit of Mt. 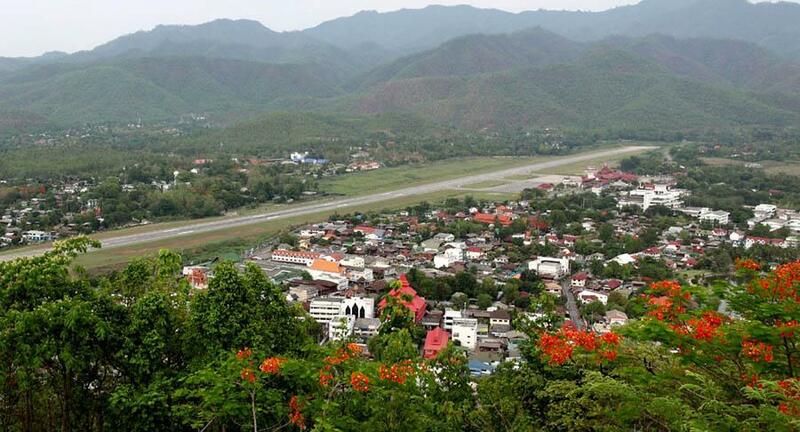 Kong Mu in Mae Hong Son of Northern Thailand. 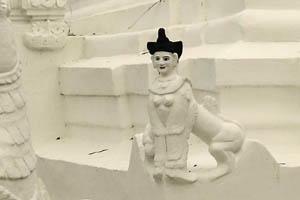 Mae Hong Son is famous for Long Neck Tribe - Ban Nai Soi, the beautiful temples at the edge of a lake, Wat Chong Kham / What Chong Klang and so on, reported on a different page. 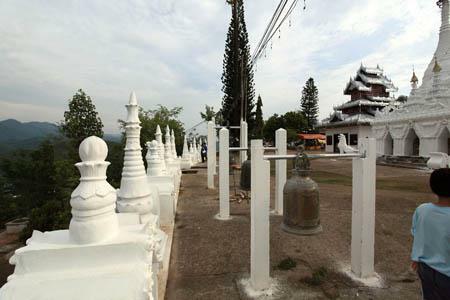 Wat Phra That Doi Kong Mu, located at the 424-meter summit of Mt. Kong Mu. 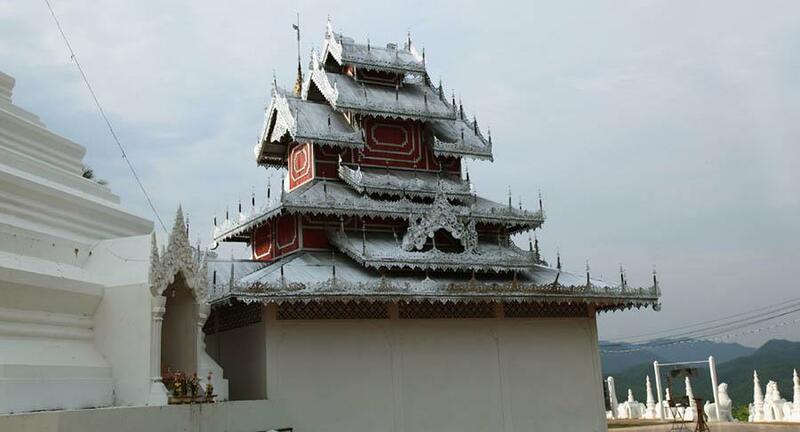 The temple Wat Phra That Doi Kong Mu, located at the 424-meter summit of Mt. 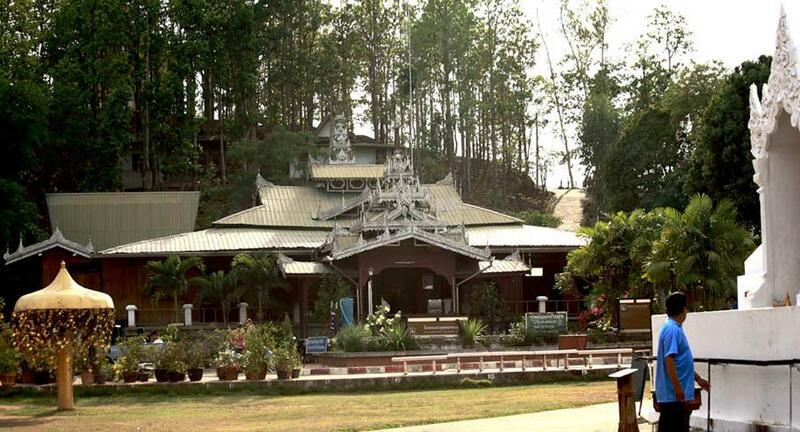 Kong Mu in Mae Hong Son. The two big white chedis will welcome you. Wat Phra That Doi Kong Mu, Amphoe Muang. The oldest and most significant landmark of the province, it stands a top Kong Mu hill, and hence can be seen from anywhere in town. 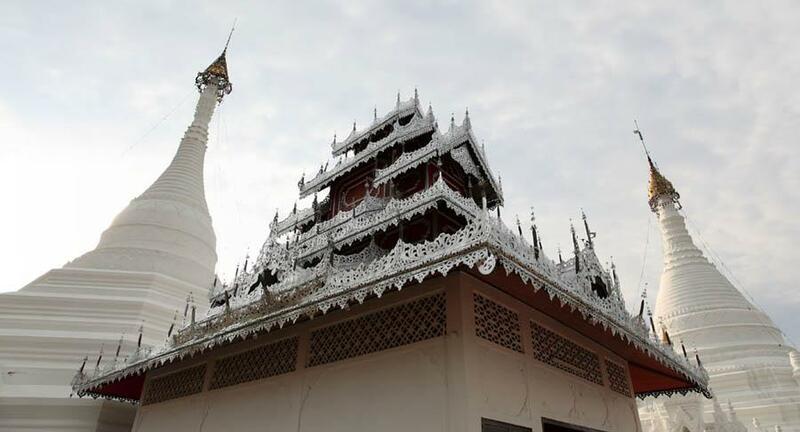 Formerly named "Wat Plai Doi", the temple has two Burmese-style Chedis (pagodas). 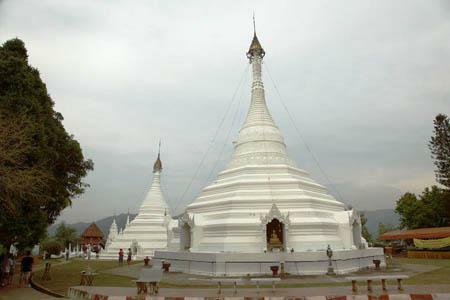 The larger Chedi was built in 1860 and contains the relics, brought from Burma, of Phra Moggalana, one of the chief disciples of the Lord Buddha. , by the builder named Chong Tong Su and Lek, his wife. 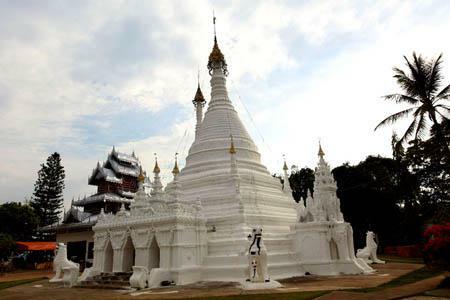 The smaller one was erected in 1874 by the first governor of Mae Hong Son, Phraya Singhanat Raja. The temple location offers a panorama view of the city and its surrounding. The temple's major annual ceremonies include New Year's Day, Songkran Festival and the End of Buddhist Lent Day (*1), in which a unique alms-giving ceremony is held. 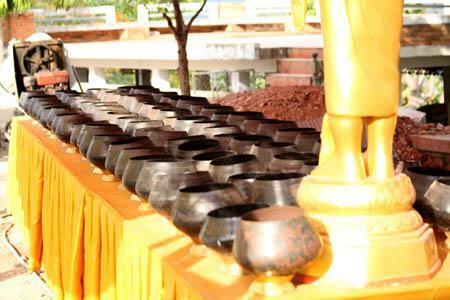 Buddhist Lent or Phansa in Thai is the three-month annual retreat observed by Theravada (Thai Buddhism) practitioners, usually from July to October. In Thai, the starting day is called Wan Khao Phansa and the ending day is called Wan Awk Phansa (Wan: day, Khao: get in, Awk: get out). 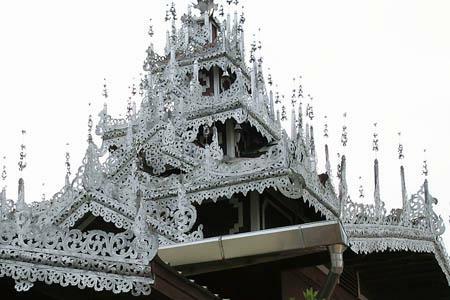 This temple has two Burmese-style Chedis. They are very beautiful. 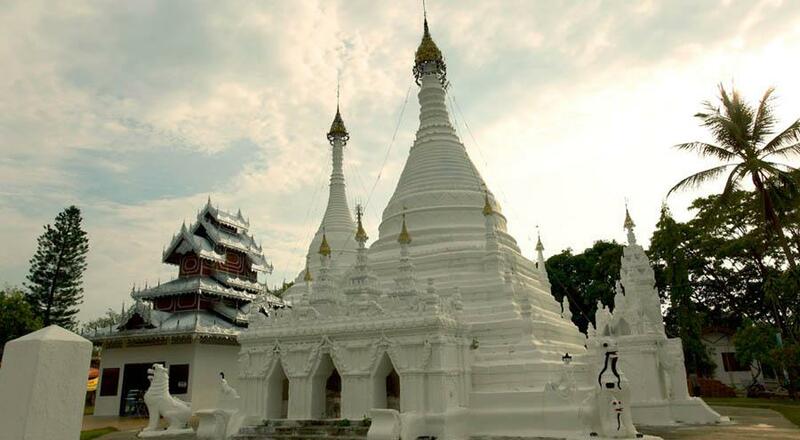 The larger chedi was built in 1860 and the smaller one was erected in 1874. Hmmm, almost 150 years ago. It's a little difficult to know which is which in the picture. The lager has kind of a longer neck around the top, ... right ? 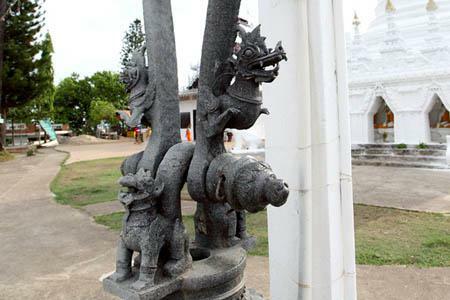 Two Burmese-style Chedis: It looks like the lager is the left chedi and the smaller is the right one. A view of the chedis from the entrance side. 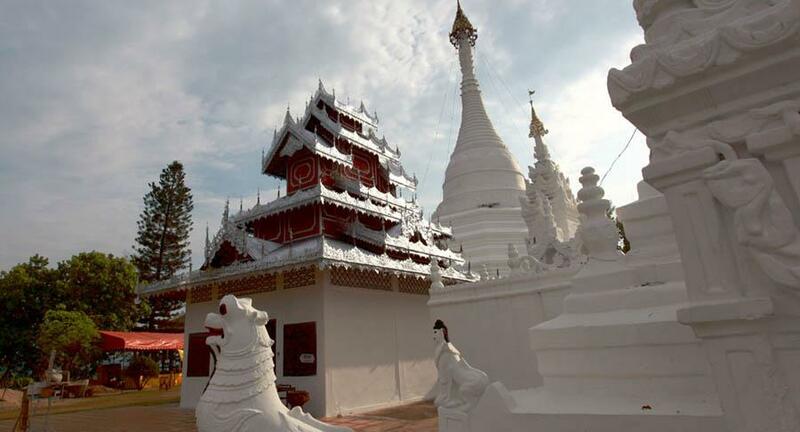 The smaller chedi in the back. 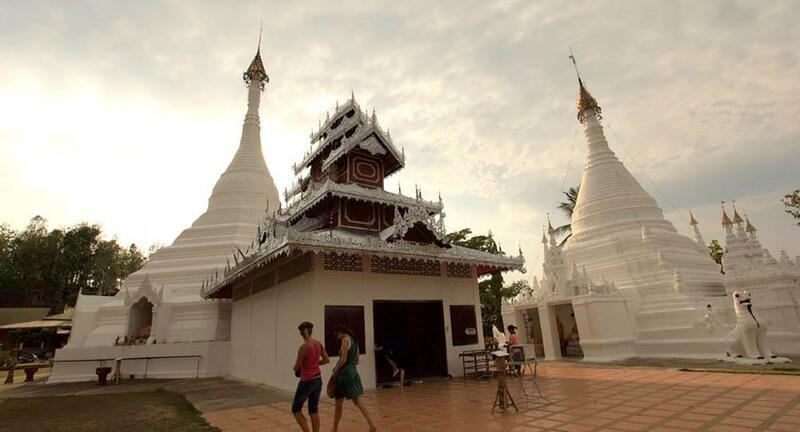 Two Burmese-style Chedis: the picture on the left is the lager chedi viewed from the entrance side and the picture on the right shows the smaller chedi in the back. The smaller one is still big, though. 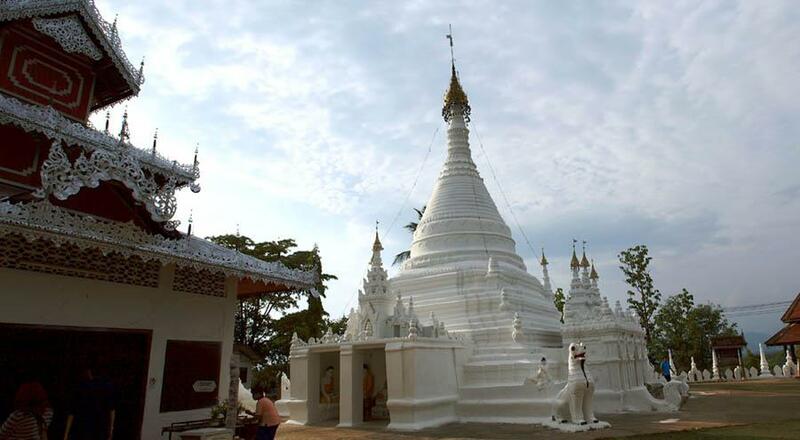 Another look of the smaller chedi. Buddhist statues are enshrined. Another look of the smaller chedi. Another Buddhist statue is enshrined as well. They maybe are lions or something , but I'm very curious about the human-shaped statue in the back. Who or what is it ? It looks the structure of the image is complicated. Another Buddhist statue is enshrined as well. Decorations of the chedis. There is a building like a Japanese castle between the two chedis. The style is very unique. A building like a Japanese castle. The building like a Japanese castle: Close-up. The building like a Japanese castle: Another angle. The building like a Japanese castle: a view of looking up with the two chedis. 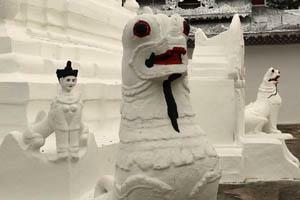 After enjoying the amazing two white chedis, let's go around the temple grounds. A large main hall. 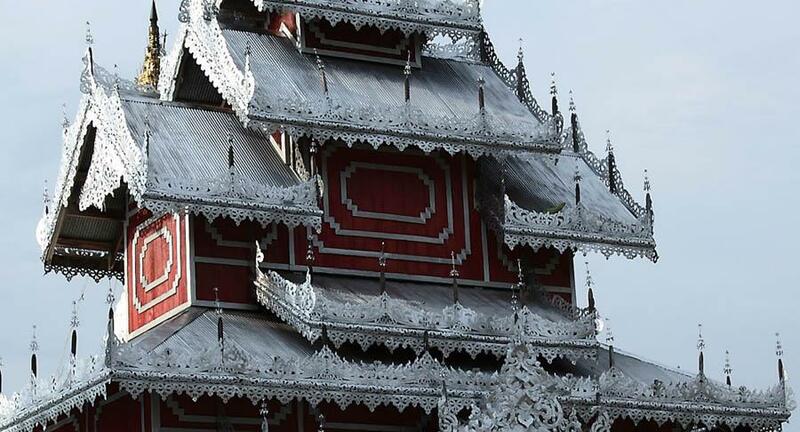 From the shape of the roof, it's maybe in the Burmese-style. The roof has many layers. The grounds of the temple. They have bells as other temples do. 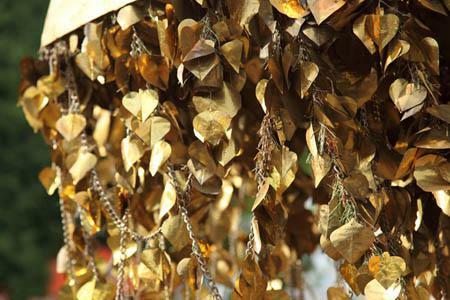 The decorations of a bell. A dragon and a lion ? The roof has many layers. The grounds of the temple. They have bells as other temples do. The decorations of a bell. A dragon and a lion ? 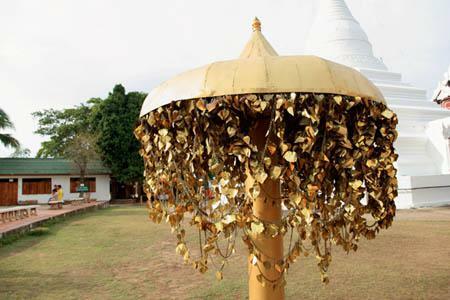 I guess this umbrella-shaped one is just donation because there are not any names or hopes written on the small leaves. A lot of bowls for putting coins while praying. I guess this umbrella-shaped one is just donation because there are not any names or hopes written on the small leaves. A lot of bowls for putting coins while praying. 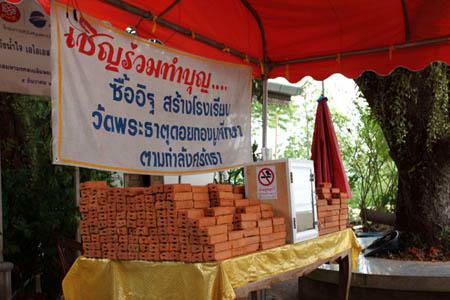 This is a donation for building a school by paying for bricks. 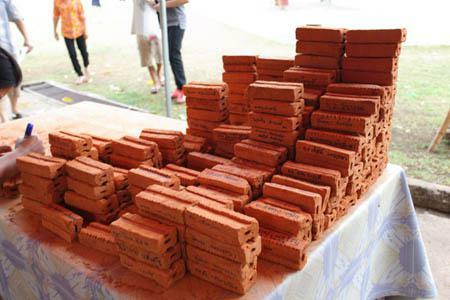 Pay for a brick as a donation and write your name on it. 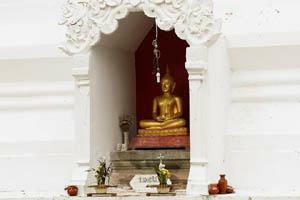 A Buddha image is enshrined. 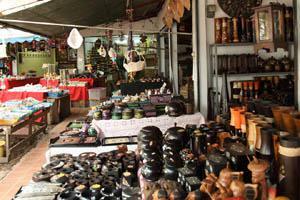 Gift shops on the grounds of the temple. 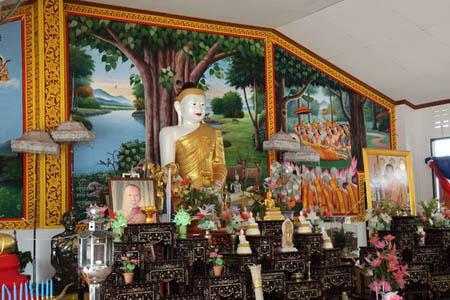 A Buddha image is enshrined. Gift shops on the grounds of the temple. Flowers on the grounds. 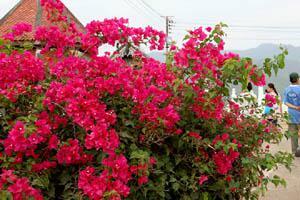 You'll see this flower in Thailand often. 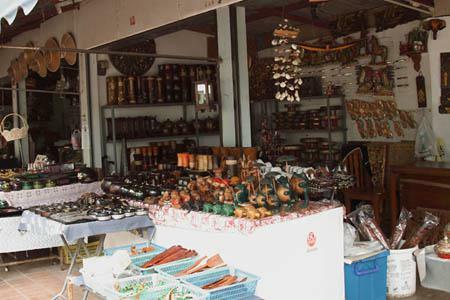 Gift shops on the grounds of the temple. 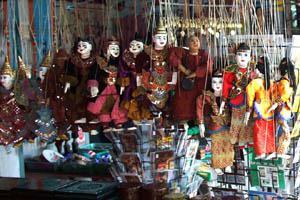 Puppets are sold. Flowers on the grounds. You'll see this flower in Thailand often. 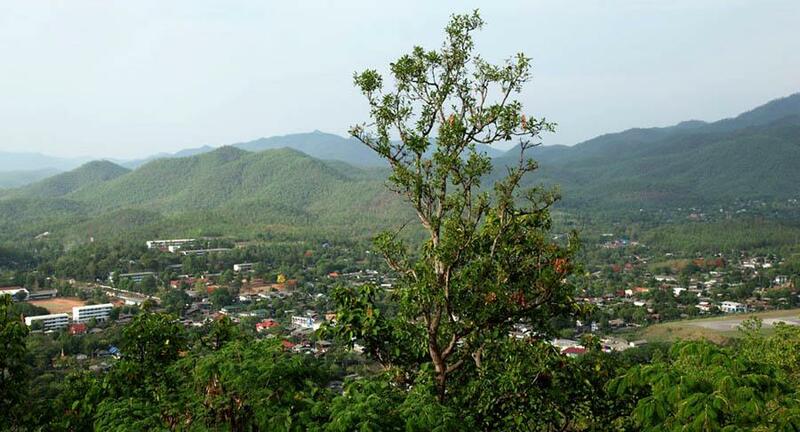 The temple stands on the hill and you can overlook the Mae Hong Son city and around that. If it's a fine day, you'll see a great scenery. From the temple. Great view. Another view from the temple. The tree is a little bit mean, though.